A chip and a chair. We’ve all repeated it to ourselves or cringed when one of those friendly and upbeat tournament opponents cheerfully said it after watching our chips be pushed in front of another yokel. Maybe no poker cliché boils poker down to its purest form as “a chip and a chair.” For the downbeatens and the degenerates and the losers, the limitless potential of owning a chip and a chair is lifeblood. It means: There’s always hope, no matter how meager the beginnings. It means: Just let me get in there to show them what I can offer. It means: Since I’ve been stripped to nothing except a single chance, there’s the potential for peace and clarity. It’s the sixth seed winning the Super Bowl. It’s an American statement as clean and pure as the Bronx cheer or chapter one in a story that has the potential to be a classic, but will most likely end crumpled up in a wastebasket. It’s a reprieve from the inevitable. It’s a reason to stay just a little longer. 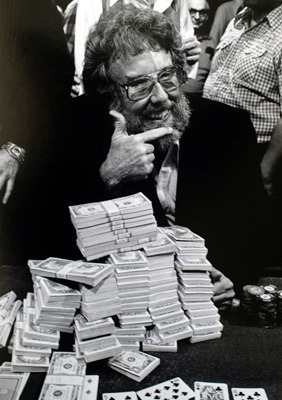 And, in the poker world, it all started with Jack Straus, a hairy degenerate giant who turned a single chip and a chair into a World Series of Poker championship bracelet. Straus was up and walking away from the table when someone spotted a $500 chip stuck under a napkin or a newspaper or the rail, depending on the story teller. He was just about to hit Fremont Street when they called him back to play his final chip of the 1982 WSOP main event. A day later, surrounded by a boisterous rail running five deep, Straus would outdraw Dewey Tomko on the river to take his second and last WSOP bracelet. And that’s where it comes from. He said it like a prayer and sometimes prayers are answered. Was he the first person to say it? Doubtful, since it seems like that phrase is one of those that always existed somewhere. But because he said it there and followed it with a run that rivals the best in WSOP history, it’s Jack Straus’s. 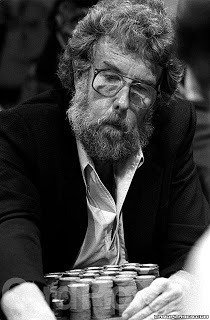 Doyle Brunson says he was 6’7”, and old pictures show him with a bushy red beard and a curly mass of hair, so no wonder everyone called him Treetop. Straus was born June 16, 1930 in Travis, Texas, to father Jack and mother, Mary Anderson. Little is known about his childhood or even if he was raised in Travis, a tiny town that currently has fewer than 60 people. Other sources have reported that Straus played basketball for Texas A&M, but there is no solid evidence this happened. His name is not found in any newspaper archives between the years 1948 and 1954, nor on stat sheets from 1950. After he graduated college, he taught for a few years before making the old Texas-Oklahoma poker circuit his life, chasing the biggest games and the biggest buzz he could find. Straus claimed his Texas blood made him a natural card player and gambler. “I think Texans just got a lot more guts has a lot to do with it, most other folks just don’t take the heat when you start playin’ real poker. In Texas you grow up playin’ poker, it’s a Texas game,” he told Al Reinert, who wrote an in-depth look of the role of Texas poker players at the 1973 WSOP for Texas Monthly magazine. Straus’s attitude about life was simple. We are to live and play. The life of a human being is a short fuse, so why not burn as bright and vicious as possible. “I have only a limited amount of time on this earth, and I want to live every second of it. That’s why I’m willing to play anyone in the world for any amount. It doesn’t matter who they are. Once they have a hundred or two hundred thousand dollars worth of chips in front of them, they all look the same. They all look like dragons to me, and I want to slay them,” from Bets, Bluffs, and Bad Beats by A. Alvarez. Although based in Houston, he followed his fellow Texas road gamblers to Vegas in the 1960s, where he got the reputation as an uber-aggressive and courageous short-handed specialist, as well as a guy who needed action just as much as food and air. Life was a true roller coaster for this giant, filled with massive windfalls of cash and just as massive losses. If he cared, he didn’t show it. A natural storyteller and a seriously freaky looking guy, he often found himself surrounded by media and railbirds at the early WSOPs and was happy to regale anyone and everyone about his philosophies. “Jack was a good time guy, sometimes too much so, as Louise and I discovered when we went on a Caribbean gambling junket with him in Curacao, an island where gambling was legal. On the plane down there, Jack and his buddies got to passing out brownies laced with marijuana,” Brunson write in his Godfather of Poker. Louise is Brunson’s straight-as-a-knife’s edge wife. On the way back to the States, Straus’s behavior got his whole traveling party strip-searched by customs. But the action was never too much for him and he stood in a card room with empty pockets more times than anybody can count. He lived the way-of-life that many gamblers covet. If Straus had a soul mate, it was probably fellow degenerate Stu Ungar. And then, surely, everyone laughed. Go watch the final hand of the 1982 WSOP main event. Tomko pushes with A 4 , Straus goes nowhere with his A-10 offsuit. “Good Lord!” he says, when he sees what’s on the table. His beard and curls have greyed, but he shifts like a five-year-old waiting for his birthday cake. A four comes right in the door and Straus just shakes his head and shrugs. It’s obvious — he’s used to this stuff. Then, a ten on the river changes everything. He is shocked and his face looks like an angel just flew down from heaven, sat on his lap and left a single rose. He is in shock and happy and then finally, a big smile appears as people start to grab him and shake him, his shoulders, his hands, anything. Six years later, on Aug. 17, 1988, Straus suffered a fatal heart attack while playing poker at the Bicycle Club in Los Angeles. People like to say when something like that happens, he died doing what he loved doing, and maybe that crossed his mind when those first pains started. He’s one of three Poker Hall of Famers to die while playing cards, joining Tom Abdo and Wild Bill Hickok.